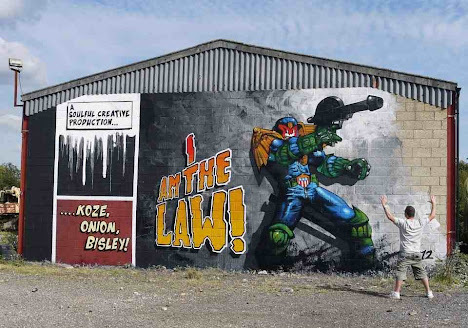 2000AD & Judge Dredd have been with us since the late 19070's and what a massive inspiration they have been! The amazing stories years ahead of their time have been brought to life by stunning artwork created by the masters like Ian Gibson, Cam Kennedy, Carlos Ezquerra and Simon Bisley to name a few. Soulful Creative artists Koze and Onion have created their own 'little' tribute to the great man himself and the artist Simon Bisley, buy painting a 60 sqm graffiti art piece designed around a graphic novel page spread.